More butterflies in the golden light of fall afternoon. Today we have a Cabbage White Butterfly (Pieris rapae) nectaring on a comfrey flower (Symphytum × uplandicum, I presume.) The yellow appears on the underwing. Below is a capture that shows the tops of the wings with their familiar white with prominent black spots. Females have a second dark spot in the forewing, so the pictured butterfly is a male. He is feeding on stevia. These butterflies are very common, but they are not native to North America. They can be a pest on agricultural crops such as, well, cabbage. Taken with a Nikkor 70-300mm AF-S VR ED; cropped. 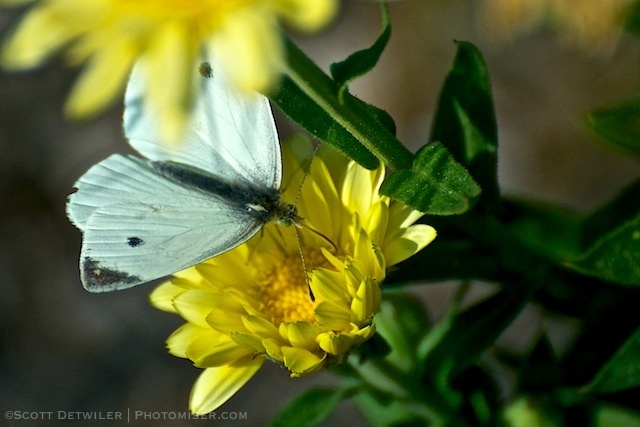 This entry was posted in Photomiser Gallery and tagged Butterflies, Butterfly, Insects. Wow. I have seen them with yellow on the underwings before, but never quite that bright. Neat photo. There’s a bit of a boost from post-processing, but yes the yellow was pretty prominent.